The Mohave ground squirrel (MGS) is listed as Threatened by the state of California and occurs throughout the western Mohave Desert. Edwards AFB represents one of four “core” areas within the species distribution. The MGS is spatially and temporally patchy, undergoes pronounced population cycles that appear related to winter rainfall, and is active only for a limited period of time between March and June. 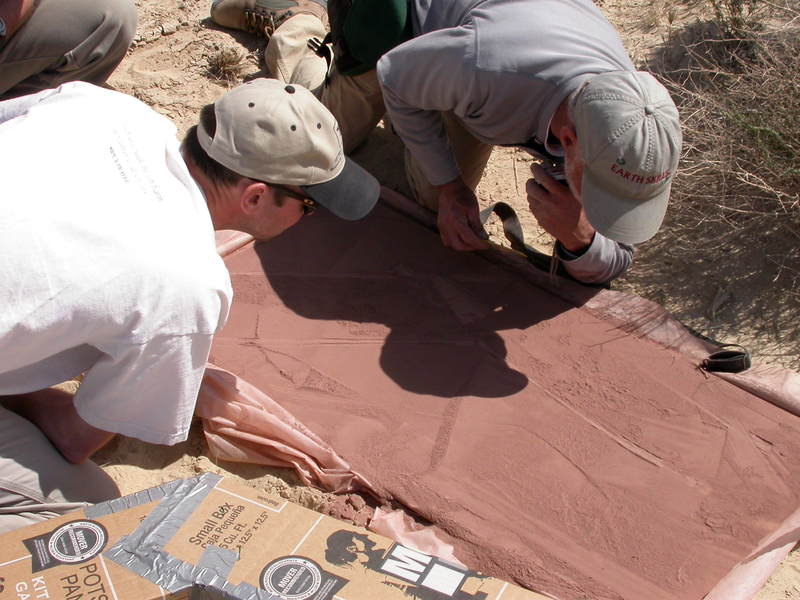 Previous trapping efforts, using trapping grids, at 60 locations on Edwards AFB detected relatively few individuals and involved extensive manpower. Due to cost of trapping and requirement to use permitted trappers, only 10 to 15 locations could be trapped annually. Furthermore, the MGS co-occurs extensively with the antelope ground squirrel (Ammospermophilus leucurus: AGS) at Edwards AFB. The objective of this project was to develop a scientifically defensible monitoring program for the MGS that is able to detect and monitor population sizes throughout the Base in a cost-effective manner, and could be expanded. Based on a detailed literature review, Tetra Tech developed a two-phase sampling design that consisted of collection of occupancy samples (phase 1) and quantitative density samples (phase 2). 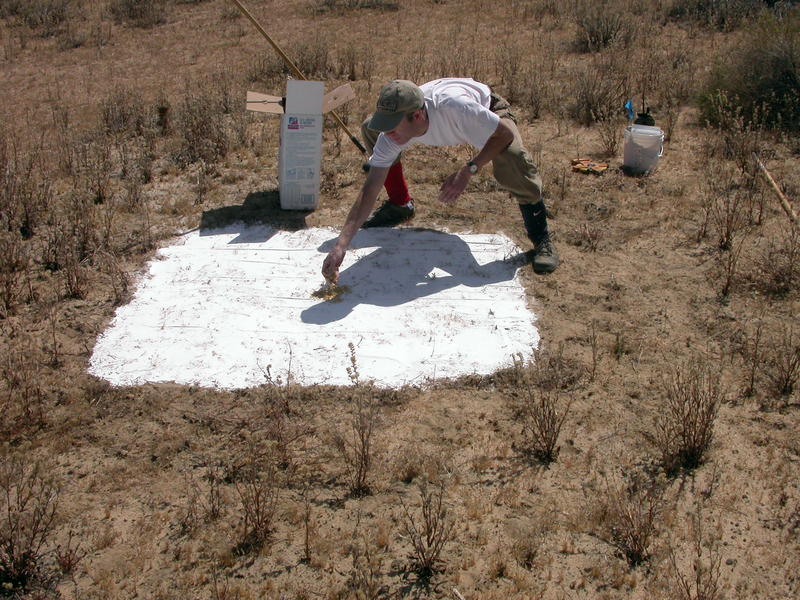 MGS and AGS were trapped during spring 2008, to collect footprints for linear discriminant analysis of track morphology. Models achieved correct classification rates of approximately 80%. The linear discriminant analysis models were validated using tracks collected in 2009. Field sampling for survey design evaluation was conducted in spring 2009. Occupancy samples consisted of 35 transects consisting of 10 track stations spaced at 50 m intervals; each transect was visited twice. Representative squirrel footprints were measured at each station. The 35 occupancy samples were distributed throughout Edwards AFB in proportion to habitat area. Occupancy (# stations per transect with MGS) ranged from 0 to 5, with MGS detected on 13 transects. Quantitative density estimates were derived from 10 trapping webs which were collocated with track transects. Trapping webs consisted of 96 traps arrayed along 12 radii with 8 traps spaced at 25 m intervals. Webs were trapped for 5 days. A total of 34 individual MGS and 15 recaptures were obtained at 4 of the 10 webs. Densities were estimated using program DISTANCE, and averaged 0.16 MGS/ha over the 10 webs, and ranged from 0 to 0.25 MGS/hectare. Based on available data, Tetra Tech conducted a population viability analysis (PVA) for the MGS population on EAFB. The PVA models indicated that the persistence of the Mohave ground squirrel population is highly sensitive to the assumption of reproductive failure during drought years. Adult survival rate is also a key factor affecting population persistence. 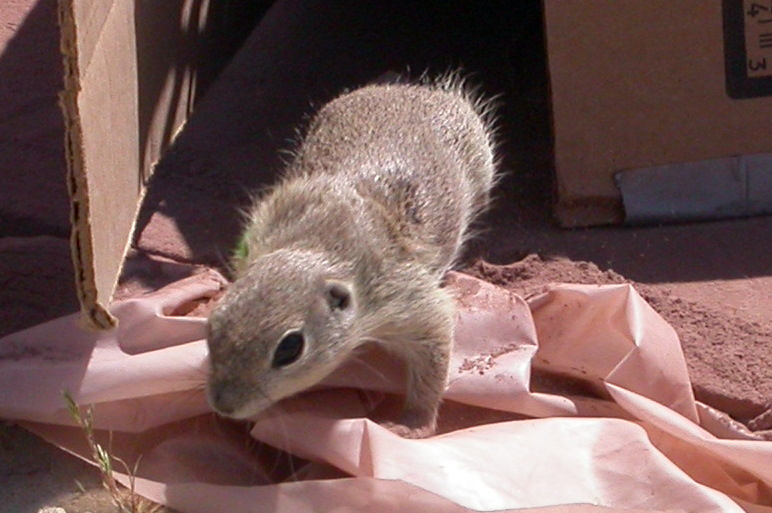 Tetra Tech recommended further studies including (1) continued monitoring within the preferred Mohave ground squirrel habitat, (2) minimization of disturbance and construction within preferred habitat during the active period (March to August), (3) implementation of use of passive integrated transponder (PIT) tags to assess long-term survival and dispersal.